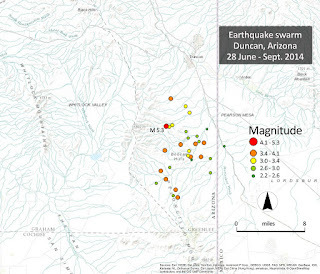 There have been a couple of tiny quakes in northwest Arizona in the past week, each just over M=1 and away from the Fredonia event. 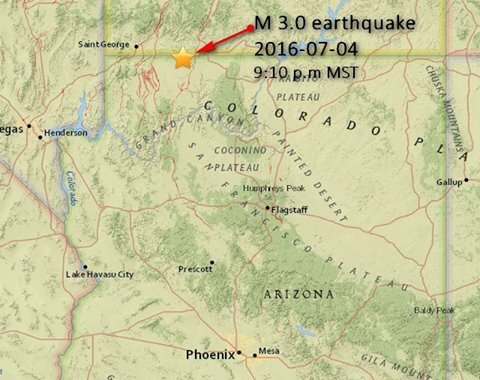 Fourth of July fireworks in Colorado City, northern Arizona, were accompanied by two small magnitude earthquakes: magnitude 3.0 at 9:10 p.m., and a M 2.5 event at 11:01 pm (MST). The affected area is in the southern end of the Intermountain Seismic Belt which extend through Utah, Idaho, and Montana. 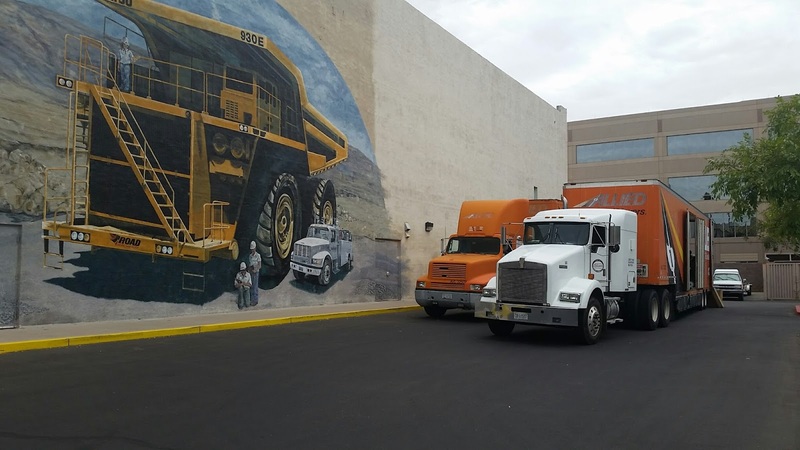 A flood of volunteers showed up at the former mining and mineral museum in Phoenix today to unload thousands of volumes from the AZGS's libraries onto temporary shelving. 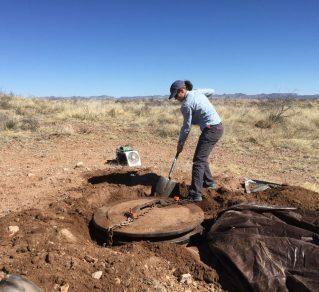 AZGS was forced to shut down our Phoenix office and dramatically reduce our Tucson assets as a result of consolidation of state agencies, which eliminated our state budget as of June 30 and transferred our duties to the University of Arizona. UA does not have space in Phoenix and only limited space in Tucson to house AZGS staff and resources. Most of the Phoenix library was preserved by moving it into the former mineral museum for storage until we can find a way to re-open that facility. 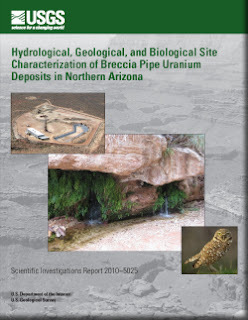 We also sent key materials from our Tucson library to fill out the collection and protect them from disposal. 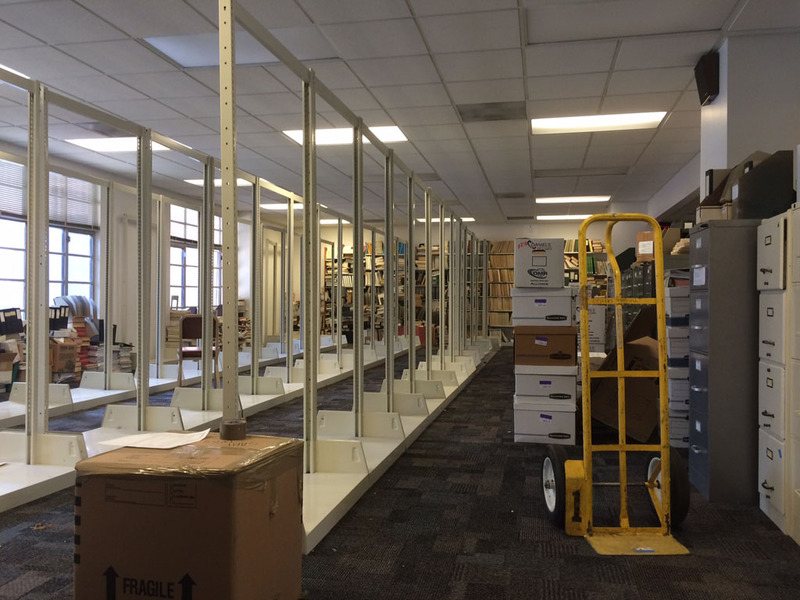 We dismantled the library shelving in Tucson and reassembled it in Phoenix. Volunteers came in today to take the library materials from moving carts and put them on the shelves. The carts were returned to the moving company. We cannot thank this group of hard-working individuals enough for their help in these challenging times. It's been a busy week. 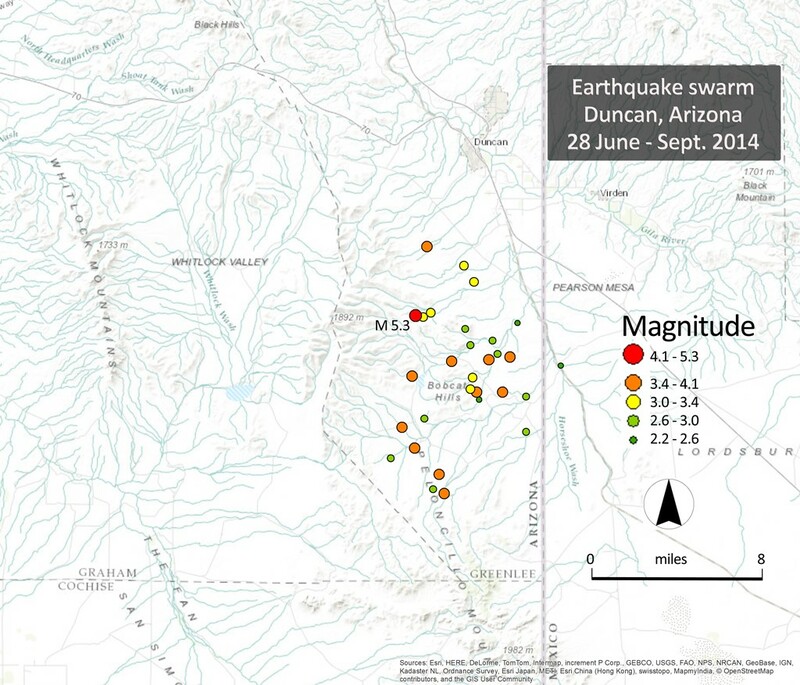 The Arizona Geological Survey moved to the University of Arizona, physically and administratively. On Monday, we packed up the Arizona Experience retail store and AZGS library shelves [right] to move to the former mining and mineral museum in Phoenix for temporary storage until that facility is re-opened and we set up a library and gift shop/store. 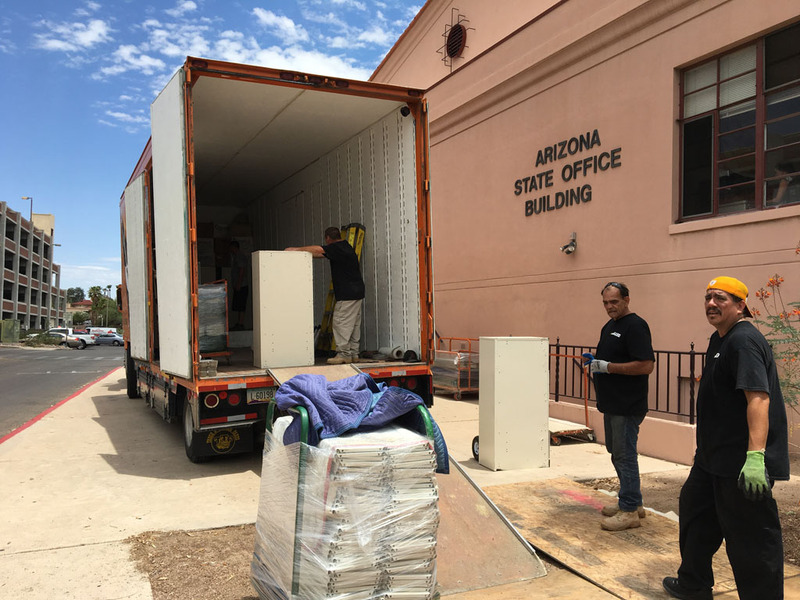 On Wednesday, movers loaded office files, about one-quarter of the AZGS geologic library, and selected equipment for the new offices in the former Arid Lands building just east of the UA campus. On Thursday, AZGS moved in, started unpacking and setting up computers, email, and internet connections. Simultaneously, the moving trucks unloaded in Phoenix, and set up the Tucson library shelves. 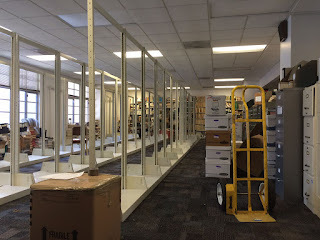 Next week, volunteers will be there to unload the dozens of carts of library books on the shelves [bottom]. We were pretty successful in finding homes for much of the materials we could not take with us. About half of the library was taken by state or university libraries, professional organizations, companies, and individuals. The least critical library materials that were disposed of (seen on the floor in the above photo) probably amount to less than a quarter of the total inventory. We had a steady stream of individuals grabbing copies of the more than 21,000 topo maps in our sales inventory. The Arizona Railway Museum collected a complete set of nearly all 2,000 titles, along with historical versions. The remaining ~15,000 maps were packed up by a sportsmen's organization for outdoor recreation users. The AZGS state websites will continue in the interim while we move everything to arizona.edu addresses. Our new space has only about one-fourth the size of our former state office space requiring a dramatic downsizing. We are still identifying what costs we are responsible for at the university as well as counting the costs of the move. That will impact our resources to fund staff positions for the rest of Fiscal Year 2017 which began July 1. These are the findings of an investigation by the Inspector General of the U.S. Dept. of Interior, dated June 15, 2016, following an inspection of a "scientific integrity incident involving the Inorganic Section of the U.S. Geological Survey's (USGS) Energy Geochemistry Laboratory in Lakewood, Colorado." 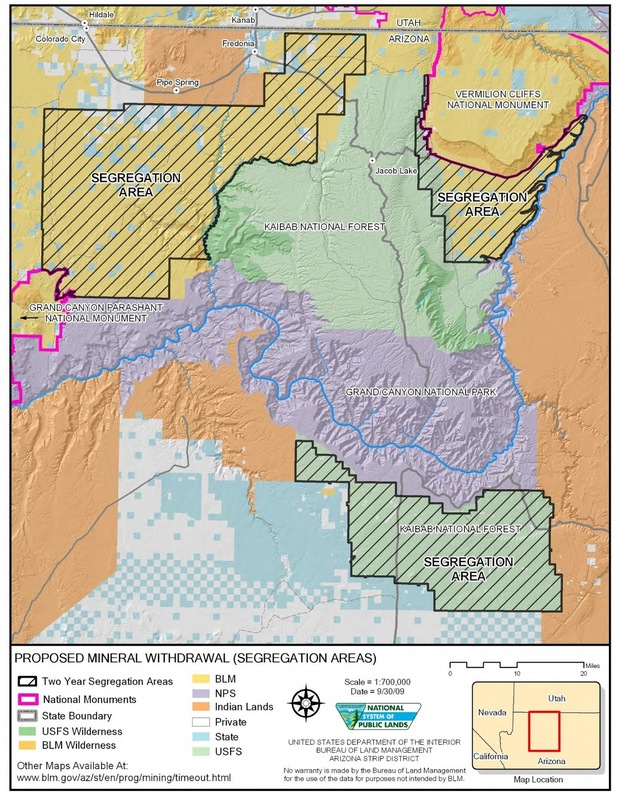 Once the results of the inquiry became known, USGS closed the Inorganic Section, effective February 25, 2016. "USGS accused the chemist of data manipulation by intentionally changing the results produced by the mass spectrometer." 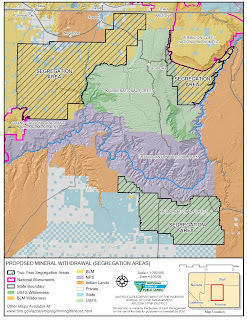 The fraudulent data could bring into question the scientific justification of the land withdrawal, and the current political effort to establish a 1.8 million acre national monument in the region specifically to protect the area from impacts on water from uranium mining. time to make a public announcement. Many organizations rely on USGS publications and could potentially make decisions or policy based on flawed information." Ref: Scientific Integrity Incident at USGS Energy Geochemistry Laboratory, Report 2016-EAU-010, Office of the Inspector General, U.S. Department of the Interior, 15p, June 2016.